CRC Coastal Manager Glenn Ricci has co-authored a chapter on Capacity Development in the International Union for Conservation of Nature (IUCN) “Protected Area Governance and Management Book,” a free resource for students and practitioners around the globe. Ricci was asked to contribute to the book because of CRC’s participation in groundbreaking capacity development work through the Western Indian Ocean-Certification of Marine Protected Area Professional (WIO-COMPAS) program. Ricci led that initiative for CRC and was asked to serve on the IUCN Capacity Development Working Group. Ricci also is working on a longer guidance document focused on performance assessment tools for protected area professionals that will be released later this year. The working group and the publications are part of a larger effort to improve the performance of marine protected area staff around the world, and in turn better protect their resources. Fisheries experts Dr. Denis Worlanyo Aheto and Dr. John Blay of the University of Cape Coast (UCC) in Ghana braved the snow and cold to travel to URI in early January to study models of integrated coastal management and outreach programs and to foster research cooperation and learning opportunities for students at both universities. “Our primary objective is to look at the various models for how universities can support capacity building in fisheries and coastal management,” said Aheto, head of the department of Fisheries and Aquatic Sciences at UCC and project manager at UCC’s new Centre for Coastal Management, funded by the United States Agency for International Development (USAID). Fisheries capacity building, research and extension are at the core of the center’s mission, said Blay, UCC fisheries professor and coordinator of the new center, and URI and Rhode Island are leaders in those areas. 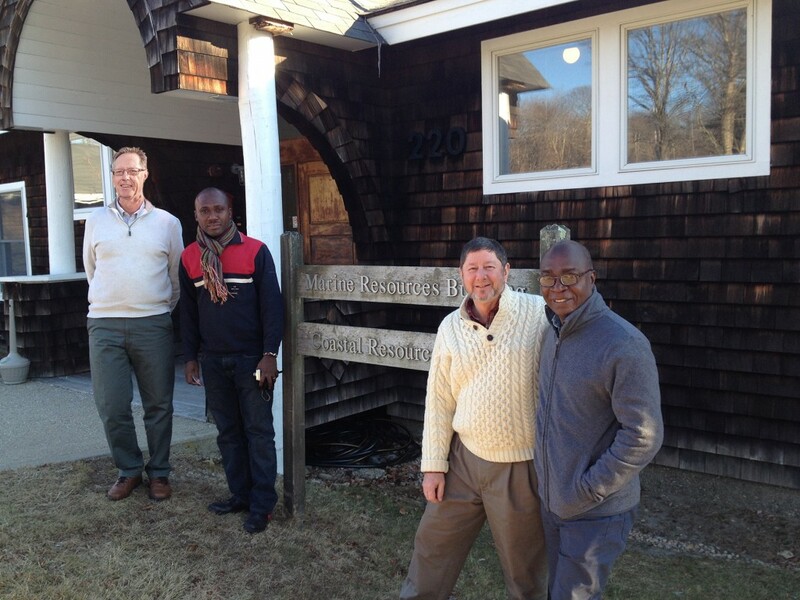 The Coastal Resources Center (CRC) at URI’s Graduate School of Oceanography hosted the men for a week as part of CRC’s USAID/Ghana Sustainable Management Fisheries Project (SFMP). Aheto and Blay held discussions with faculty and top administrators across URI, met with members of the Commercial Fisheries Research Foundation and Save the Bay, visited National Oceanic and Atmospheric Administration and Department of Environmental Management offices and learned about Rhode Island Sea Grant’s extension and outreach work. “The Sea Grant model is fantastic,” Blay said. “The role of the state is very strong in driving research in fisheries (in Rhode Island),” Aheto observed. “We would like to adapt this to the situation in coastal Ghana.” They said the URI and Sea Grant experiences have provided them with a framework for addressing the challenge of bringing the government of Ghana on board in terms of commitment and funding for fisheries and coastal management and overcoming the lack of connection among organizations. “That is really the issue (in Ghana), the need to establish a strong connection. There is too large a gulf between the university, the government and the fishermen,” Aheto said. “The Commercial Fisherman’s Research Foundation is very interesting” in its strong connections to URI and fisheries research, Blay said. “In Ghana the fishermen are not seeing the university as a resource.” That lack of integration translates to a lack of support for university research, the men say, and they want to change that. Developing that capacity is where the role of URI is particularly important. One of the goals of the five-year SFMP initiative is to strengthen UCC’s fisheries and coastal management department by hosting up to 10 masters and doctoral students from UCC at URI, sponsoring other student and faculty exchanges, conducting joint research and holding a fisheries leadership course in Ghana that draws on URI’s experiences. Such capacity building already is underway. Next month UCC students begin SFMP fieldwork in two estuary areas in Ghana, said Najih Lazar who is transitioning from the URI Fisheries Center to join SFMP in Ghana as fisheries advisor. “We will focus on applied research, working directly with two communities. UCC students will collect data from fishermen and exchange information with them,” explained Lazar. Back in Ghana, Blay and Aheto will share what they have learned with their colleagues and counterparts in the government and make their case for outreach and integration. “We are going to make ourselves relevant through discussions with government and fishers and get the dialogue going,” Blay said. UCC’s Center for Coastal Management already is gaining momentum, they said. The fisheries and coastal management department has bought three vehicles that will allow its 50 undergraduates and 20 graduate students access to field sites for research, and laboratories are getting new equipment and renovation. “We are like new kids on the block. There is much to be excited about,” Aheto said. When the United Nations Nippon Foundation of Japan Fellowship Programme names its fellows every year, the organization chooses the research institution placement for each recipient. However, when Zahidah “Zaidy” Nisa learned she had been awarded a marine/ocean research fellowship in early 2014, she requested URI, and the foundation honored her request. Zaidy, an environmental management specialist attached with the Ministry of Agriculture, Lands, Forestry, Fisheries & Environment, Government of Grenada, sought to pursue her studies at URI because of the small-scale fisheries expertise found at the Graduate School of Oceanography’s Coastal Resources Center (CRC). While Nippon fellows have come to URI before, this is the first time CRC has hosted a fellow. Zaidy met Crawford in early 2014, before arriving at URI, when he was a panelist at the 15th meeting of the Informal Consultative Process on Oceans and the Law of the Sea (ICP): The role of Seafood in Global food security. “This gave me an opportunity to meet with him at the UN and discuss my research in detail,” she said. Her interests were a perfect fit with CRC’s ongoing international marine and coastal initiatives, including current fisheries projects as they relate to poverty and food security in Malawi and Ghana in Africa and previous work in Latin America and Asia. Arriving at CRC during the summer, Zaidy pursued fellowship research focusing on the recent adoption of the UN Food and Agriculture Organization’s International Voluntary Guidelines (SSF-VG) for Small-scale Fisheries in the context of Food and Security and Poverty. Her thesis explored the potential for partnerships to share the responsibility for the implementation of SSF–VG via regional and national networks in Small Island Developing States. In her research, she specifically looked at functions of the Caribbean Network of Fisherfolk Organizations and the Locally Managed Marine Area network alongside the network functions recognized in the SSF-VG. Zaidy has been involved with both networks over the years. 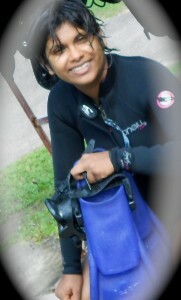 Originally from Fiji Islands, Zaidy received her bachelor of science degree from the University of the South Pacific and her master’s in environment management and development at Australian National University. She worked in the field of coastal fisheries management and livelihoods in the South Pacific region for eight years before moving to the Caribbean. There, she has been working on Marine Protected Areas Governance and the strengthening of fisher organizations and networks with The Centre for Resource Management and Environmental Studies, University of West Indies. “During my time at CRC I was able to engage and spend time with practitioners working in Asia and West Africa Region and got exposed to the fisheries management and governance issues, management models and lesson learned from their work. This has helped me to learn about a new region. I also learned social network analysis tools, which are about mapping and measuring of relationships and flows among people, groups, organizations and information/knowledge processing entities,” she said. Being able to create a visual map of networking efforts and information flow in relation to small-scale fisheries will help her in monitoring of the effectiveness of her networking efforts. Zaidy concluded her fellowship at CRC in December and returned home to Grenada where she will continue her research on the ground through her position with the Government of Grenada. The UN-Nippon Foundation fellowship program began a decade ago as a way to offer opportunities to mid-level professionals and government officials from developing states to pursue advanced education and research in ocean affairs, law of the sea and related marine science disciplines in support of better marine and ocean management. The UN’s Division for Ocean Affairs and the Law of the Sea (DOALOS) of the Office of Legal Affairs administers the nine-month fellowships, which begin with three months of research and training at DOALOS headquarters in New York followed by six months of research and study at a partner institution. Next week CRC will lead a study tour to New York, New Jersey and New Orleans for Vietnamese officials as part of the United States Agency for International Development (USAID) Vietnam Forests and Deltas Program. The program aims to help Vietnam put into practice policies and strategies regarding climate change and low emissions development in conjunction with Vietnam’s Ministry of Agriculture and Rural Development and provincial governments. The study tour (Oct. 21-29) will provide opportunities for Vietnamese officials and leaders to consider broader adaptation strategies for rivers and deltas, such as alternatives to traditional defensive barriers that include dykes or seawalls. Additionally, the tour will allow consideration of plans for what may inevitably be resettlement in certain coastal areas. The group will visit government, business, academia and community leaders working in the New York/New Jersey region as well as the New Orleans region of the Mississippi Delta. These locations are large urban centers with significant waterfront infrastructure, industry and active communities engaged in developing strategies to address climate change and resiliency challenges.